Status: Rare casual spring migrant statewide. Rare regular fall migrant statewide. Rare casual winter visitor. Accidental in summer. Documentation: Specimen: UNSM ZM7675, 1904 Omaha, Douglas Co.
Taxonomy: The two former subspecies of Black Scoter M. nigra, were raised to species status, the American subspecies retaining the English name Black Scoter as M. americana and the Eurasian species Common Scoter M. nigra (Chesser et al 2017). Spring: There are five accepted spring reports: 25 Feb 1999 Branched Oak Lake, Lancaster Co, 7 Apr 2010 adult male Branched Oak Lake, 10 Apr 2015 Cedar Co, 21 Apr 2012 adult male Branched Oak Lake, four on 1 May 1949 in Logan Co (Brown 1950). Summer: The only record is of a male at Desoto NWR, Washington Co 25 Jul 1986 (Mollhoff 1987). Earlier dates are 28 Sep 1895, a specimen taken in Lancaster Co (Bruner et al 1904), and one at Branched Oak Lake 7 Oct 2012. Later dates are all from Lake Ogallala, Keith Co: two on 7-18 Dec 1997 with one remaining until 4 Jan 1998 (Brogie 1998, 1999), four on 12 Dec 1998 with one remaining until 1 Jan 1999, two on 3 Dec 1999 through 15 Jan 2000, one on 31 Dec 2016, and a juvenile 2-8 Jan 2011. Specimens mounted by Ralph Velich of Omaha were taken near Blair, Washington Co Dec 1956 (two females), and near Ashland, Saunders Co in Dec (1956?) (Gates 1958). This species migrates regularly southward along the Great Lakes in Michigan from Sep to Dec (Baldassarre 2014). High counts: 20 in Lincoln, Lancaster Co 25 Oct 2006, 18 near Lincoln 21 Nov 2010, and 6 at Branched Oak Lake 18 Nov 2007. Winter: Overwintering has not been observed, although there are two midwinter reports and three additional reports of birds lingering into Jan (see Fall). The mid-winter reports are 16 Jan 1927, Missouri River, Sarpy Co (Bray et al 1986), and three adult males and two females at Stage Coach L, Lancaster Co 19 Jan 2019. This species winters uncommonly on the Great Lakes and rarely on the Gulf Coast (Baldassarre 2014). 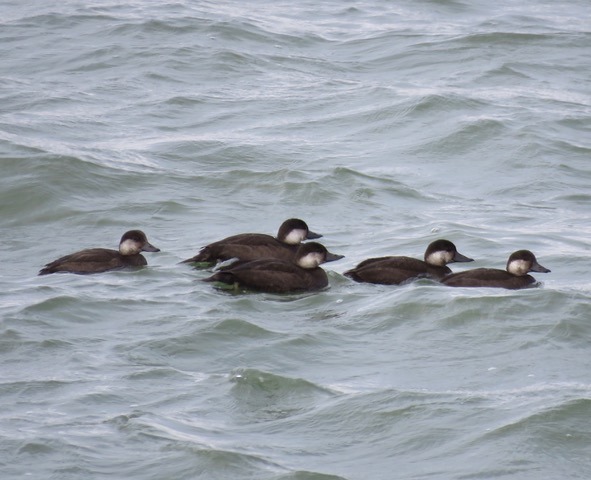 Black Scoters at Lewis and Clark Lake, Knox Co 14 Oct 2018. Photo by Mark A. Brogie. Brown, J. 1950. American Scoter at Hoagland, Logan County. NBR 18: 33-34. Gates, D. 1958. General Notes. NBR 26: 9.